How do Repair Shops benefit with the RAR network? Welcome to the largest source of new business available!!! As a Repair Shop, how do you find new customers today with the changes in marketing? In 1998 the Internet beat out the yellow pages for generating new customers, but today few shops have adapted. Most every shop manager says that their customer base is all repeat business and referrals. Bottom-line marketing by-referral-only means you are not marketing to the public for new customers. If you want more business, then we have a large source of new customers for you. Network! Network! and Network! Shop-to-Shop business as never before! You are getting more business from this directory right now!! What is the networking opportunity? 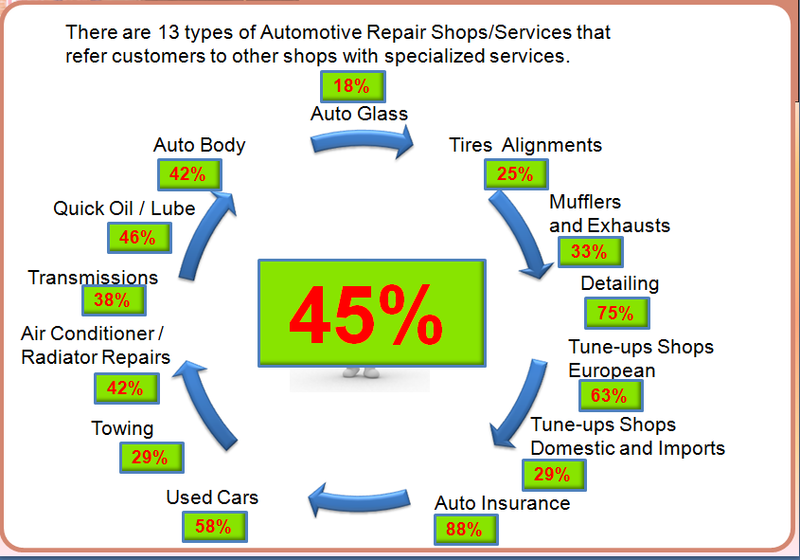 On average 45% of the interviewed shops did not know where to refer their customers requiring other auto services. The Towing, Tires and Glass shops seem to have the best networking relationships and do the most referring. With rare exceptions, almost no shops could confidently refer needy customers to all the auto services. Well today with over 580 nominated shops, BC's largest shop repairs web directory they have a great selection of trustworthy shops that they can refer their customers too! You can now network and build relationships by actually meeting these award winners, and sending them referral business. Bottom-line everyone can probably double their incoming industry referrals by more networking. The more industry referrals you receive the more RAR stars you get on the RAR directory, which in turn gives you more customers and more business. It is a Win-Win-Win......Everybody wins! Receiving more Shop-To-Shop referrals from this network of award-winning companies in each RAR surveyed city. Generated NEW customers from the RAR lead generating website. Do you borrow your Customers or do you ask them to come back? We increase client retention and yearly customer servicing by activating our "RAR-Alert" - maintenance alert program for increasing regular servicing. Bottom-line we will communicate with your clients by email, text message or by direct phone calls to alert them of their next appointment. Using the RAR-Alert program you can expect 2.7 visits per year to increase to 3.5 visits per year per customer. How did I win the RAR award? After an extensive survey through out most major cities in BC, we have now identified the top Automotive Repair/Service Shops known for their honesty, skills and dedicated customer service. The Referred Auto Repairs (RAR) awards are chosen by your PEERS for the Most Professional Automotive Services in one of 12+ categories. What do the RAR Stars mean? With the combined effort of our Research Development Department and Marketing and Communications Teams, we have managed to identify those shops with the top reputations in the Industry. This has been done through an extensive peer nomination process from which the winning shops are awarded a 1 to 5 RAR Star designation for each category. In addition, the RAR directory is dynamic which allows the shops to increase their "RAR Stars" by participation, referral networking and future studies and surveys conducted by our Marketing and Communications Team. Note: each winner has been nominated by other shop owners in their community who are well rooted themselves with an overall average of 10+ years in the business. How do I turn my company business on? Your company is set to go and is only missing your approval. Then you are operational and open for more business from the largest Auto Repair Network in BC.